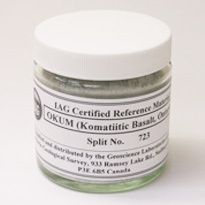 OKUM is an ultramafic rock powder reference material certified for major and trace element mass fractions. This material is typical of a Mg-poor komatiite or komatiitic basalt. The source material for OKUM was collected at Serpentine Mountain in McArthur Township, 25 km south of Timmins, NE Ontario, Canada. OKUM represents a 1.5 m wide spinifex zone at the top of a 14 m wide flow that showed good differentiation into various units. The sample consists of black massive rocks composed of randomly oriented spinifex blades 5-10 cm long. A pronounced bluish-grey weathered surface extended 0.5-1 cm into the face that showed exceptional development of spinifex texture. This material was blasted or sawed off and was not incorporated into the sample. 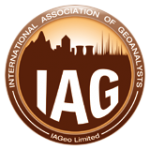 Over 700 kg were collected from a 2 x 3 m site that was part of flat glaciated outcrop over 100 m in diameter. Approximately 500 kg of this material was jaw-crushed and ground to 90% < 63 µm (-230 mesh) using a continuous-feed Cr-steel ring mill. 313 kg of the pulverized material was then blended for 24 hours in a large-capacity blender and bottled in 500 ml containers. A fraction of this original material was later rebottled into 100 g splits for certification and distribution through the IAG.